It might be tempting to conclude that David Humphrey is too facile a painter for his own damn good – that his command of brush, surface, and pigment across a spectrum from representational to abstract is so assured, his vision so pristinely and confidently realized on the canvas, that he leaves little room for viewers to make their own interpretations, or for fellow artists to perceive a validating struggle. It all seems to look so easy. That, however, is a misconception. As his exhibition “New Paintings and Sculpture,” smartly hung at Fredericks & Freiser, demonstrates, Humphrey employs his virtuosity not to dictate airtight rules of aesthetic engagement but rather to establish open-ended vectors of inquiry that can lead to a range of earned conclusions. He is nowhere near as essayistic as a resolutely narrative painter like, say, Nicole Eisenman. If Humphrey begins conversations decisively – his paintings are like plangent keynotes – he does not presume to finish them. He is a cohesive and fully engaged painter, however, and does explore certain themes. In his last solo show in early 2017, also at Fredericks & Freiser, Humphrey seemed impelled to render people of different races interacting. Now, gender and the environment seem to be preoccupations. At the same time, even his evidently political work is archly oblique. 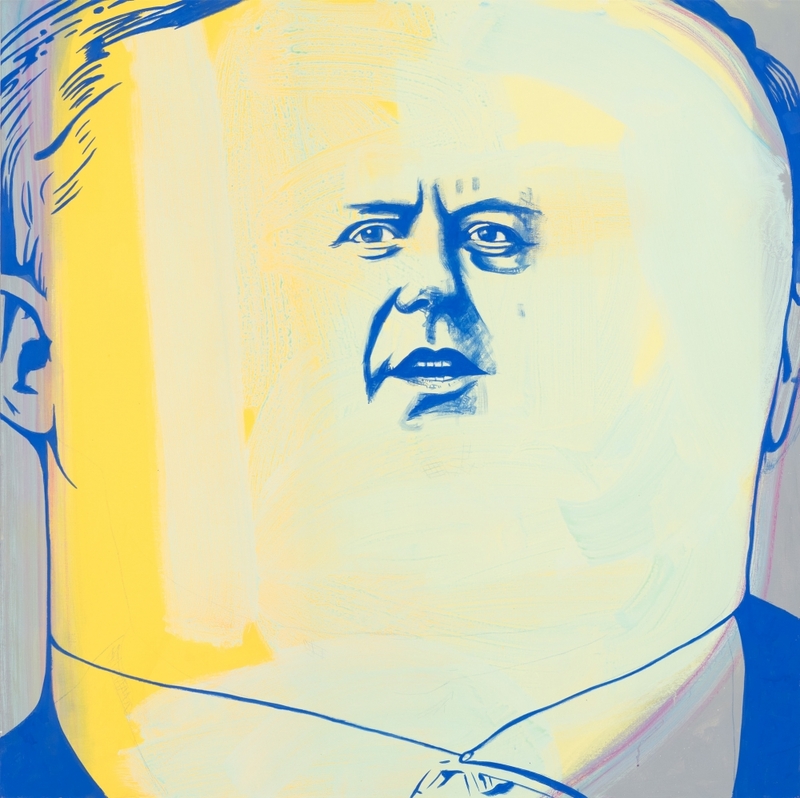 Dominating the back room is Legislator, a four-by-four painting (acrylic, like the rest in this show) of a grotesquely bulbous yellow head with an undifferentiated neck, its incongruously chiseled face occupying a small fraction of its surface area. Perhaps the most obvious interpretation of the swollen noggin and the tiny, bemused visage is that they represent Donald Trump’s comprehensive engulfment. Conversely, the image could also reflect a benign but frustrated popular will struggling against a would-be tyrant. Or something else altogether. Broad and ambiguous contextual clues could (but need not) be gleaned from the plaster sculpture Horse and Rider (possible allusions include Paul Revere, Ichabod Crane, and Lady Godiva) in the center, and from the other two large and equally evocative paintings on the opposite wall – Out of the Muck and Burning – which both involve women in action, the latter depicting Humphrey’s wife, artist Jennifer Coates, setting a letter addressed to her on fire. The small paintings arrayed salon-style on the connecting wall demonstrate Humphrey’s stylistic range and versatility, which allow him to convey different tones and moods deftly. Because they are less complex than the bigger pieces and singularly focused, they also frame a mischievous and whimsical sensibility: what looks like a casual little study for (or memo about) Legislator is called Dribble Face. Indeed, Humphrey’s work brims with visual wit that some might mistake for glibness. There’s encapsulated fun in a martini glass doubling as a bridle in Cocktail Horse, for instance, and in Tiger, the mini-puzzle of an asymmetrical diptych in which the big cat’s haunches only scan as such when a head, even then too small, is appended. But Humphrey does not belittle or minimize anything, really. On the contrary, the small things for him merely refract the bigger picture. In the main gallery space, three large paintings titled Friends, Horsing Around, and Snooze portray male interaction from different perspectives, all of them subliminal and slyly disquieting. The former, for example, depicts some “friends” as apes with long, prehensile tails (or something), hanging around close by yet perhaps different, albeit related, species – a possible nod to the expanding social dynamics of diversity. Cement Truck, a muscular painting, casts the eponymous construction vehicle as a discreetly anthropomorphic drag car with huge exhaust pipes, at once thrilling and imperiling, while the pointedly more delicate, pink-white-and-green Scooter juxtaposes a downbeat trio of men with the presumptively elating motorbike. The treacherously dual nature of technology and the shaky relationship between purported progress or recreation and actual joy – ill-fated vehicles are a Humphrey motif –lurks in these paintings as well as the more overt Overturned, where a crashed truck, eyed by birds on a wire, is made to resemble mangled roadkill. As for other existential realities, in Poodle Humphrey invests what we tame and domesticate with an alarm we may choose not to register; it’s not the novelty dog painting it may at first appear to be. The sculpture Flower, standing alone, suggests how selective the apprehension of beauty is: people tend to ignore the less appealing plumbing of plants and other people alike; Humphrey does not. Clearly the intellectual stuff of his work is not simple or reductive, and the effort he makes to articulate it without being didactic is substantial and successful. In the combined sculpture and wall piece Viewer, Humphrey applies some conceptual meta-glue to his enterprise, enshrining the reciprocal subjectivity between artist and audience. The plaster object so titled looks from one perspective like a mounted camera, from another like a human standing on his or her head. Superimposed, the sculpted figure and the image under its inspection might be a grinning biped in profile or, shifting 180 degrees, a solemn quadruped. That figure includes, as what seems like a notional lens, a paint-obscured page from an essay about an artist named Humphrey. In bold is the exhortation: “With that in mind, consider The Sculptor.” Here and throughout the show, of course, the painter retains the whip hand. The wall component comprises both block-like geometric shapes and gestural marks – a contrapuntal pairing of attentive regimentation and flamboyant abandon that is a hallmark of Humphrey’s work. This pervasive device enables him to be seamlessly intimate as well as expansive, current as well as timeless, commending his work to dissecting examination while imparting the boffo visual jolts required, as they always do, to reel us in. “David Humphrey: New Paintings and Sculpture” Fredericks & Freiser, 536 W 24th St, New York, NY. Through April 19, 2019.